If you are a beginner to needlepoint, start with a very basic, simple pattern, like the rose in the Kreinik Silk Gauze Rose kit, available at Kreinik.com. 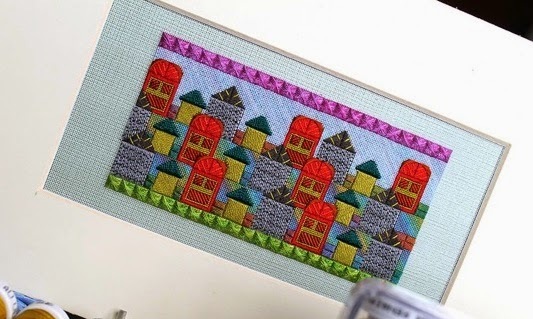 If you already know how to do needlepoint — if you are an intermediate to advanced stitcher — then the easiest way to learn silk gauze embroidery is with a class. 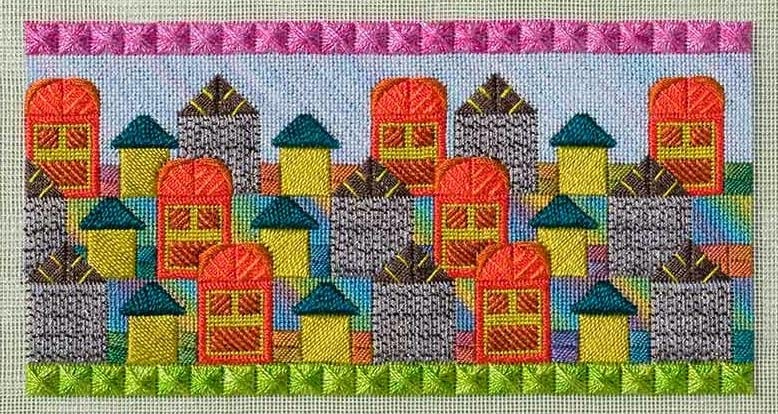 If your local needlework store doesn't offer a class, the American Needlepoint Guild (ANG) has something for you at this year's seminar. 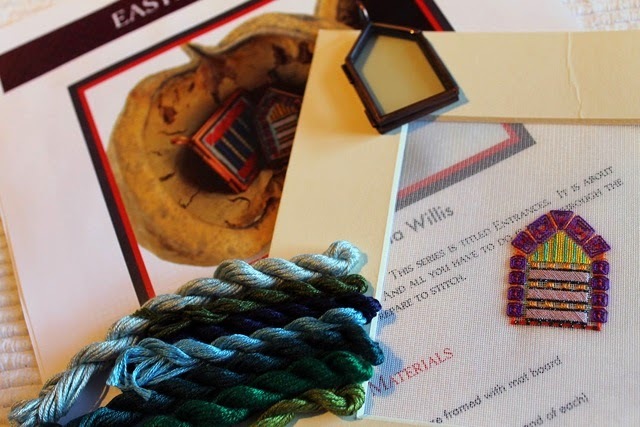 Designer and teacher Orna Willis, who creates stunning silk gauze designs, will be teaching "The Village I Built" on silk gauze. Here is a link to the seminar page where you can become a member of ANG* and sign up for the class here. "I have used silk gauze a lot these past two years. I love it!" said Orna, who shared these photos of some other designs using silk gauze. 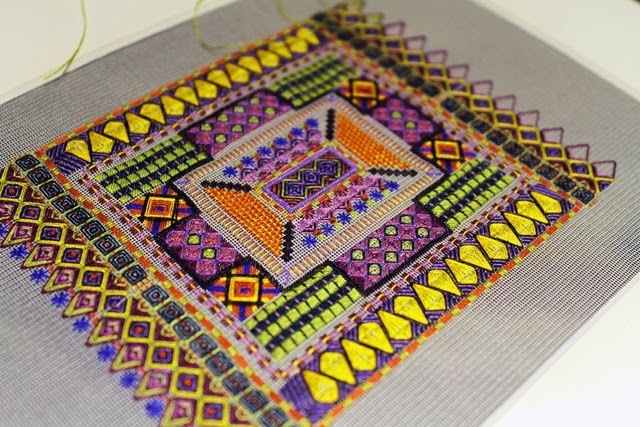 "There is another piece that is probably one of my favorite designs of all times, it's a modern sampler. The others are very small pieces that are meant to be placed in lockets that I provide." 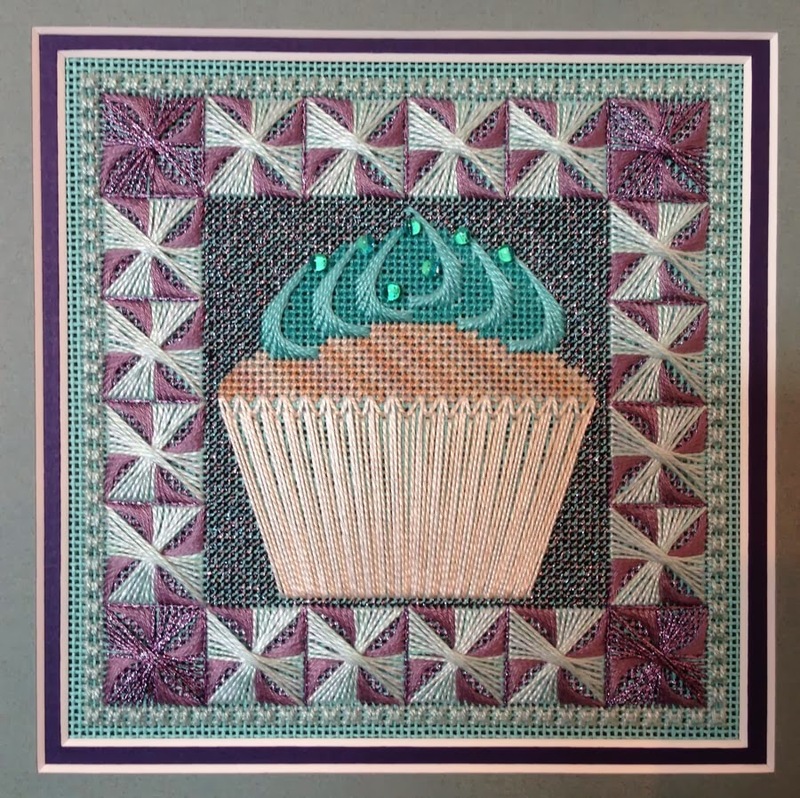 To see more of Orna's patterns, visit her web site here and her Etsy shop here. Most people think of a quilt simply as the piecework part, but actually the fabric base is just the beginning of what makes a quilt so eye-catching. A quilt tells a story, and without all the creative layers that story is incomplete—or at the very least, dull. 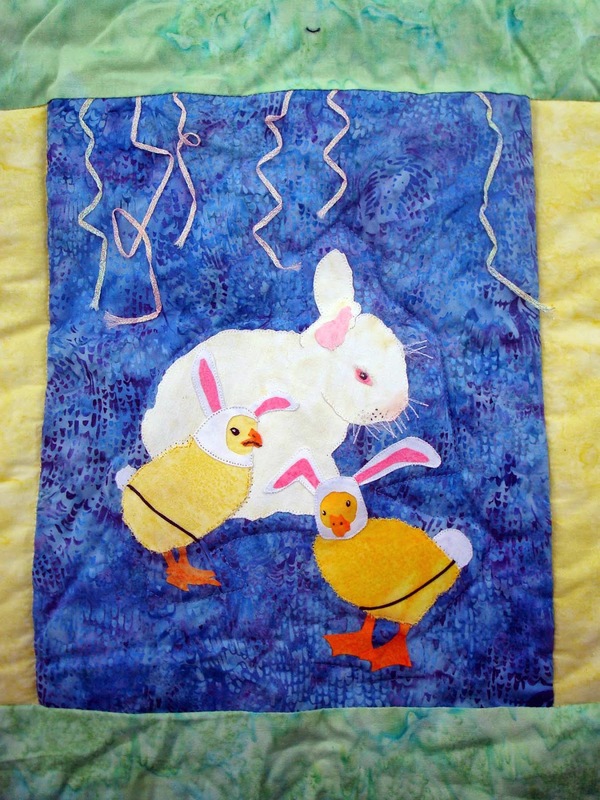 Take a look at the beautiful new Bullas Bunnies quilt pattern by Nan Baker to see one fun story come to life. 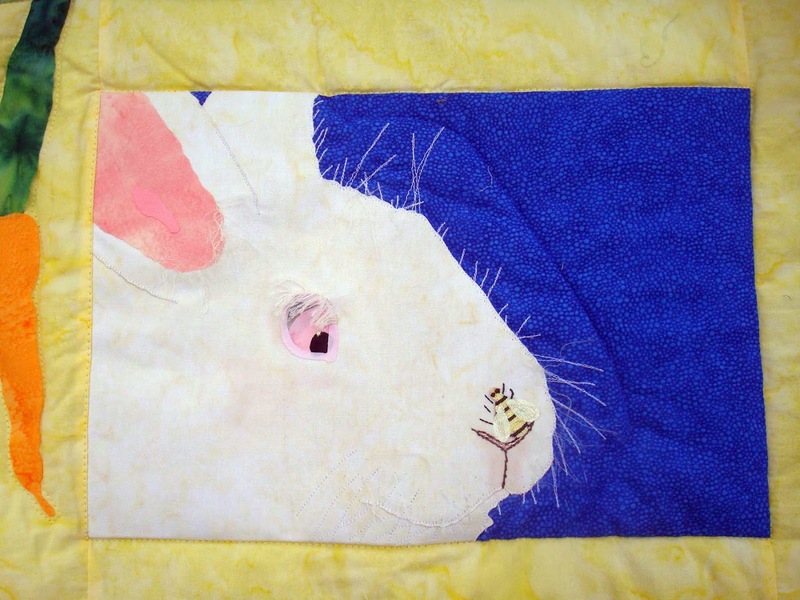 Nan collaborated with Will Bullas to adapt his artwork to fabric, and the result is a "hare-em" of storybook rabbits ready to bring spring cheer to your home, a baby's room, a hospital corridor, or any place in need of smile. You can buy the pattern through www.purrfectspots.com. Nan chose spring-colored Hoffman fabrics with neutral patterns so that the bunnies would take the focus. The cobalt blue squares add a vibrant pop of color while giving a perfect contrast to the white bunnies. Appliqued carrots are popping up throughout, just like in a real garden. But the best part, the mischievous, curious, charming, and sweet personalities of each appliqued rabbit or chick, is created with the thread embellishment. Nan used Kreinik metallic embroidery threads and iron-on threads to create the details on each face. They are used in simple embroidery stitches, but the effect completes the story to top off the fun theme. The soft metallic thread gives the sparkle in the eye that makes you see personality behind each bunny and chick. The threads complete the story, and it's all so cute and fun. 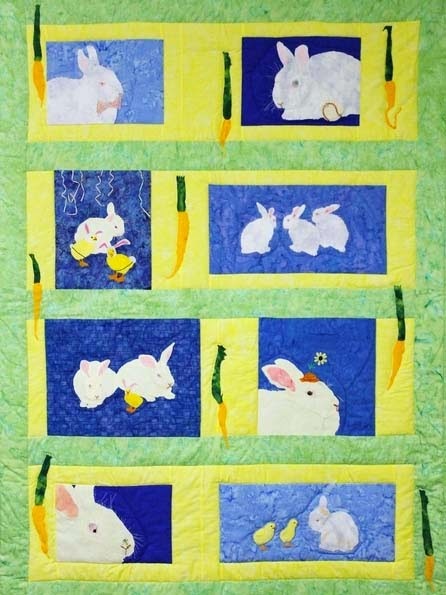 To get the pattern for Nan Baker's Bullas Bunnies quilt, go to www.purrfectspots.com. The pattern is also available through The Pattern Peddlers and www.QuiltWoman.com. 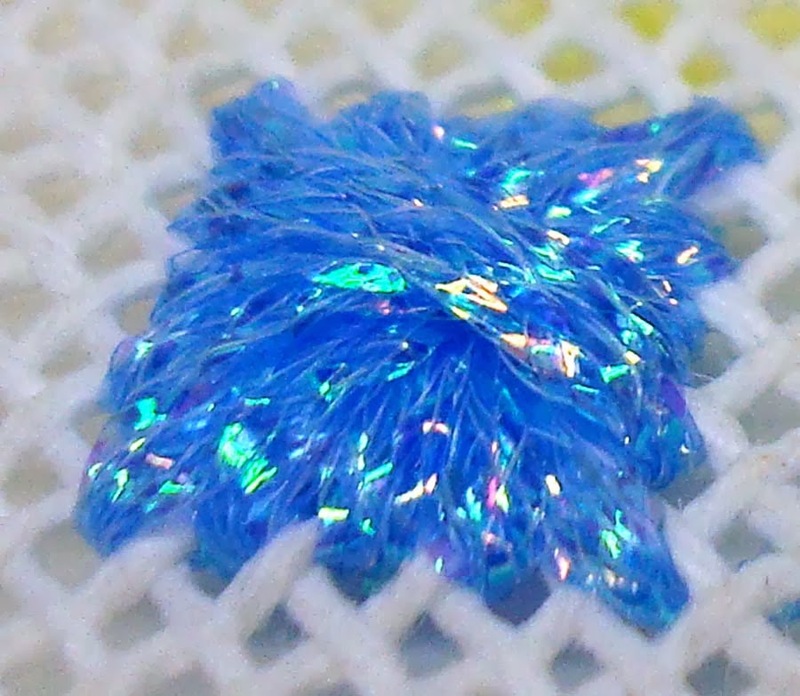 To get the threads, go to www.kreinik.com. 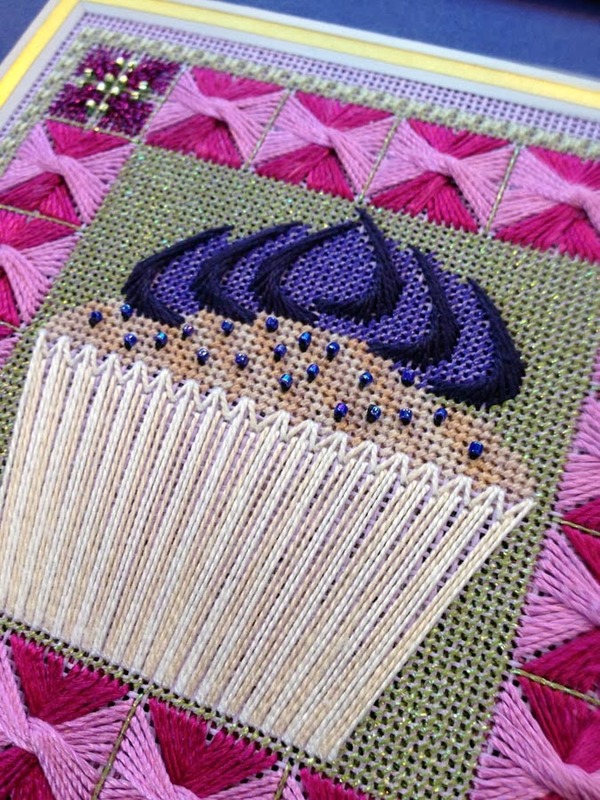 New from West End Embroidery: four deliciously colorful stitched cupcake designs. 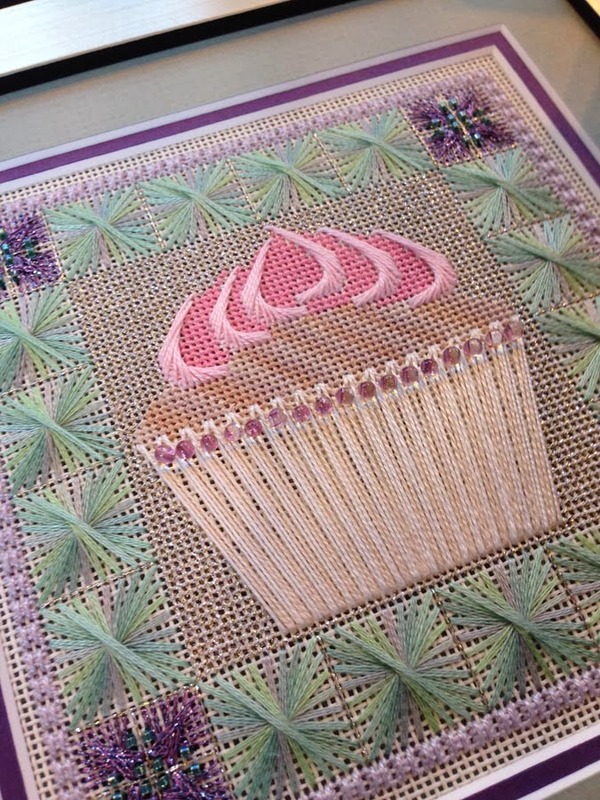 They fall under the category of Counted Needlepoint, or Charted Needlepoint—which means needlepointers will love them, and cross stitchers bored with basic cross stitching can do them. West End Embroidery designer Yvonne Close is a teacher as well as designer, so rest assured her instructions are easy to read and thorough. Aside from the vibrant colors that instantly cheer you up, plus the tempting subject matter of cupcakes, these designs are a breath of fresh air for other reasons. 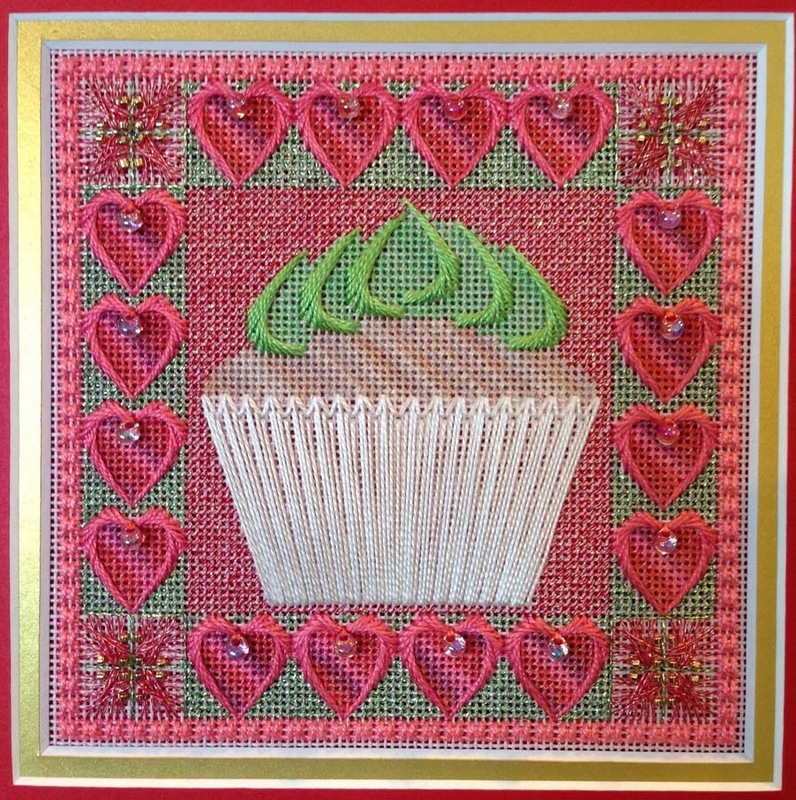 The finished size is about 5" square, small enough that you can complete them in short time. 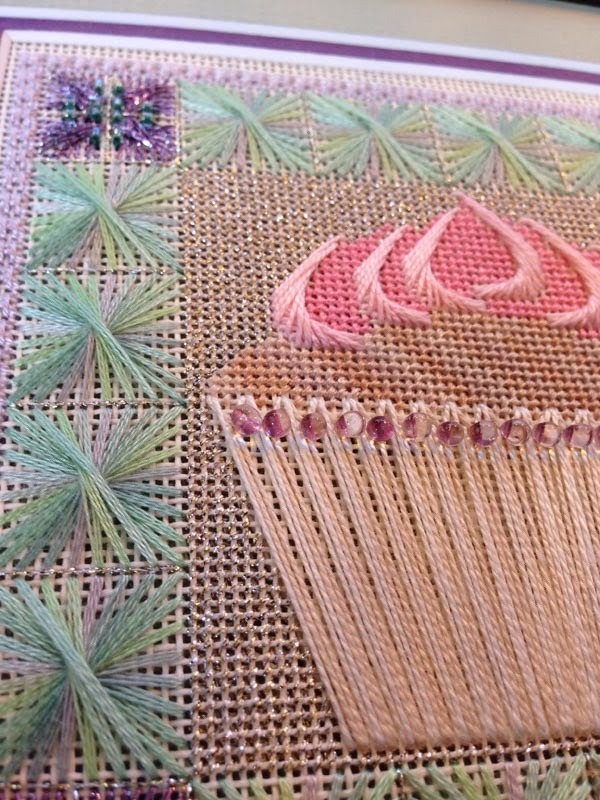 The stitch variety is do-able but interesting enough that you will have fun stitching. Also, full kits are available (with instructions, threads, beads and a 9" square of 18-count mono canvas); this is helpful if you live far from needlework stores. These designs look like high-end boutique creations, but can be stitched at very reasonable cost. But let's talk about those colors…Yvonne selected hues in pearl cottons, stranded cottons, Threadworx overdyes, Kreinik Very Fine #4 Braid, Kreinik Fine #8 Braid, and Kreinik Silk Serica. She added beads for extra dimension. Silk Serica is a filament silk that has a rich, beautiful sheen. The Kreinik metallic threads include newer color additions: 4013 Purple Haze, 4011V Adventure Green, 5540 Boysenberry Blue, 5735 Key Lime Pie, and 024L Fiery Fuchsia—all trendy shades in home decor. Your finished cupcakes will amaze and delight everyone. Stitch all four and hang them together in your home—gorgeous! “Deliciously bright” and “gorgeous” describe the six new metallic thread colors from Kreinik that debuted at The National NeedleArts Association trade show last month. The new colors are arriving in needlework stores now in Kreinik Very Fine #4, Fine #8, Tapestry #12, and Medium #16 Braid sizes, which are the most popular metallic threads for cross stitch, hand embroidery, and needlepoint. The beautiful bright 9732 Blue Grass and 9132 Lemon Grass have a pearly hue that gives them more color depth than basic metallic threads. These two shades follow in the footsteps of last year’s release, 9032 Easter Grass, which introduced an iridescent thread reminiscent of dichroic glass: the color changes according to the light and neighboring colors. Originally part of Kreinik’s fly fishing line of products, Easter Grass, Lemon Grass, and Blue Grass are summery, youthful and energetic, bringing a pop of color to any design. 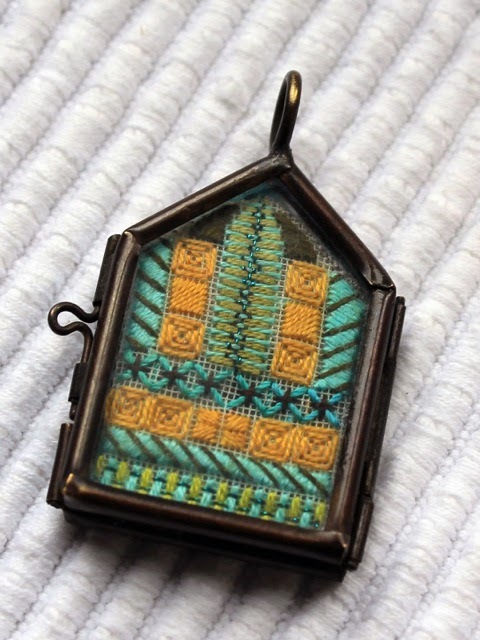 “When I saw the raw material we were using in the fly fishing line, I knew we had to braid them for stitchers,” said Kreinik Creative Director Dena Lenham. “The second I stitched with them I fell in love with the cheerful color and the prismatic depth. It’s not your usual metallic finish,” she adds. “It’s more fun.” Colors 9732 Blue Grass and 9132 Lemon Grass are also available in Kreinik Blending Filament. 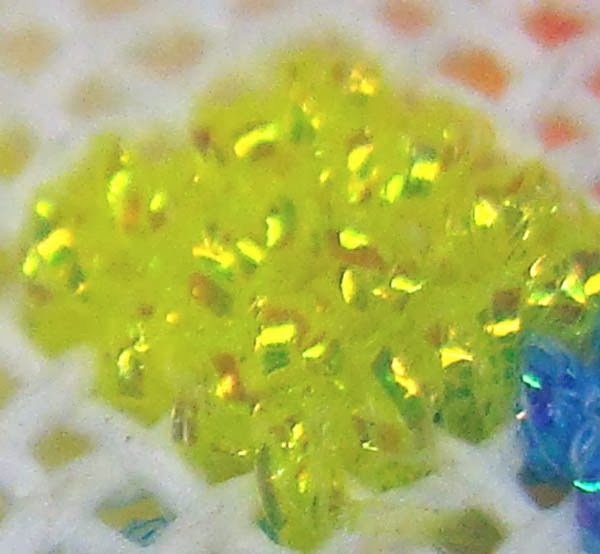 The second group of color additions came out of designer requests for blends of gold, similar to the way Kreinik Pearl was added to the Gourmet color line to make the Candy Colors. “Gold is the most popular metallic color,” Dena said. “Here we blended that favorite with spicy red, olive, amber, and plum to create rich, elegant threads. They are inspired by cloisonne of the Byzantine Era, Renaissance period art, and modern world travels.” The romantic, sophisticated colors are 5805 Golden Pimento, 5815 Golden Chardonnay, 5835 Golden Olive, and 5845 Golden Cabernet. 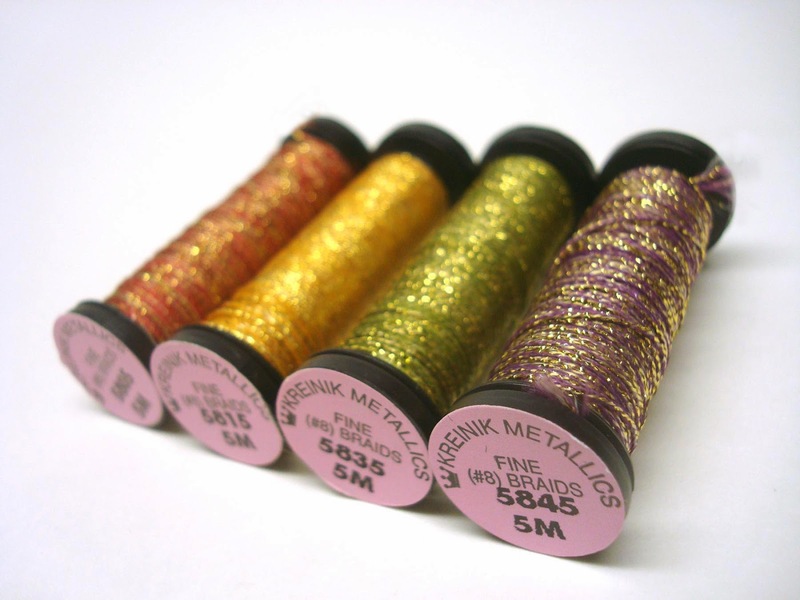 For more information on the six new Kreinik metallic thread colors, visit needlework shops or www.kreinik.com. 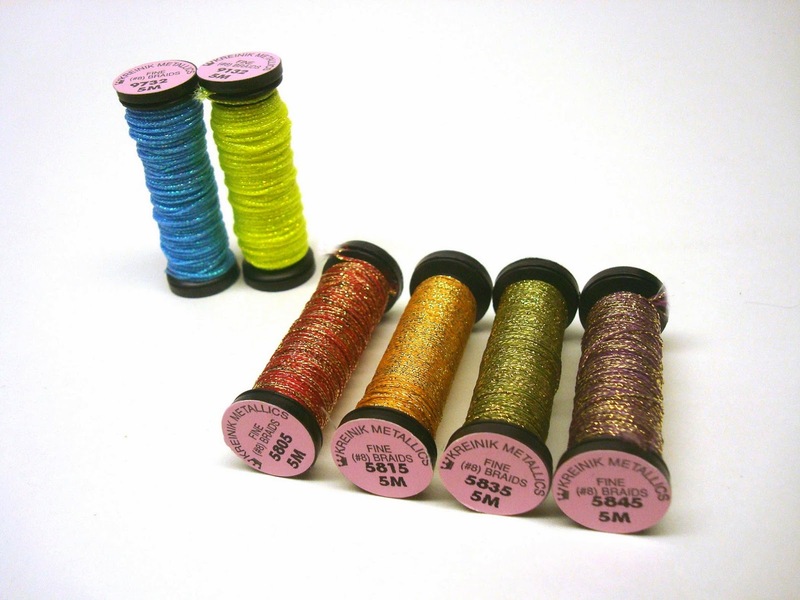 Look for the six new shades to be added to Kreinik’s 1/16” Ribbon color line later this year.